Alda, a MozaCajú farmer in Nangade, Mozambique, shows off the young, green cashew nuts that emerged on her cashew trees in September. After harvesting her cashew nuts and apples, she will begin the process of commercialization. Cashew farmers in Mozambique like Alda Filomena André work hard all year to secure a good harvest from their cashew trees. 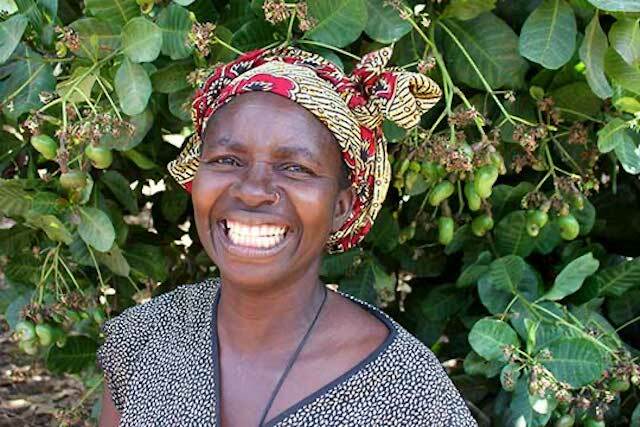 She and her husband have a farm of several hundred trees in the northern province of Cabo Delgado, where a significant portion of the cashew production in the country occurs. In Mozambique, January and February is the time for farmers like Alda to plant new cashew seedlings. In March they are pruning and cleaning their trees. In June and July, they treat the trees for protection from pests and disease. In September they clean them again in preparation for the harvest. Finally, by late October the harvest season starts, lasting through December. After the harvest comes perhaps the most important stage – commercialization. Commercialization is the process of making a harvest available on the market, from the initial collection, storage and aggregation all the way through the final sale of the product. For cashew farmers like Alda, it is the time when they can finally reap the benefits from cultivating cashew. They may work hard all the way up to harvesting the cashew from the trees, but if they do not succeed at commercialization then they will not earn a good profit. Cashew farmers are maximizing their profits using commercialization techniques they learned through MozaCajú. 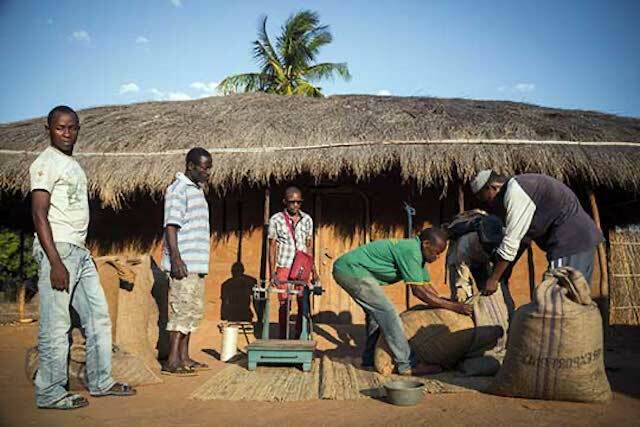 Traditionally, cashew farmers in northern Mozambique harvest and sell their cashew nuts all at once. Most commonly, a buyer – some local trader perhaps working alone or on behalf of a factory or warehouse – will come to a cashew producing community with a large scale and will buy as much raw cashew nut as the farmers are willing and able to sell at that time, without much negotiation. As most cashew producing communities are in rural areas of the country, cashew farmers are often disconnected from markets and information about the price of their product. Usually farmers only get one or two opportunities and if they do not sell at that time then it will be difficult for them to take their product to a market to sell later. In today’s world of increasing connectivity and shared technology, this problem should not exist. Since 2014, MozaCajú, a three-year project funded by USDA and implemented by TechnoServe that connects Mozambican smallholder cashew farmers to markets and factories, has been training cashew farmers in the three northern provinces of Cabo Delgado, Nampula and Zambézia on commercialization techniques in order to fill the gap in knowledge and information that has prevented them from maximizing their profits. These trainings are organized into sessions on My Cashew Business (O Meu Negocio de Caju), which covers all aspects of commercialization. 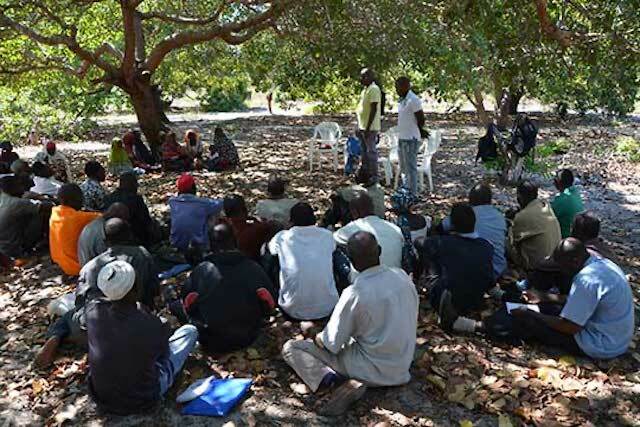 Farmers gather under a cashew tree for a recent My Cashew Business training session in Pebane, Mozambique. The training is given first to promoters, farmers who are known and trusted in their communities and are selected according to specific criteria. These promoters then disseminate the knowledge and information to other cashew farmers in their community, who are formed into groups of 20 to 30 farmers each. In this way, MozaCajú is reaching over 23,000 cashew farmers with trainings on improved cashew production and commercialization techniques. In late September, at the final My Cashew Business session of in Pebane district of Zambézia province, the promoters and farmers sit under the shade of a large cashew tree. The group learns about pre- and post-harvesting techniques, such as cleaning the ground around the tree, separating the cashew nuts from the apples without exposing them to moisture, or storing the cashew nuts in jute bags lifted off the ground. Later, they discuss topics such as tracking their costs and revenue by keeping records of all aspects of production, including the productivity of each tree or the application of chemical treatment. This will help the farmers to analyze their return on investment and make smarter decisions. 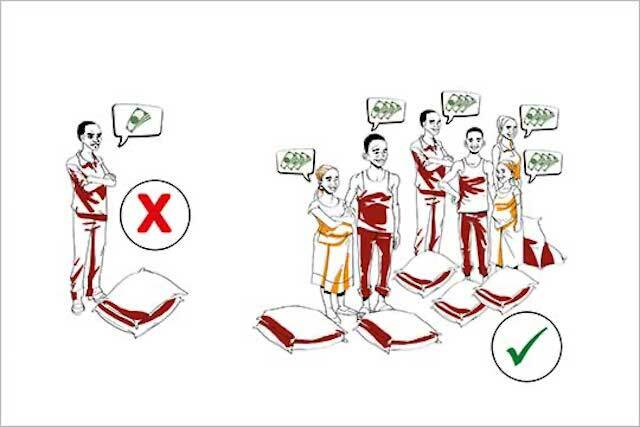 A drawing from the MozaCajú Field Manual encourages farmers to sell their cashew in groups in order to negotiate prices. They learn how about MozaCajú’s CommCare platform, which uses mobile technology to facilitate cashew commercialization by linking farmers with buyers through a digital platform based on SMS messages. Additionally, they learn how to organize themselves into groups and aggregate their product. This will help the farmers to negotiate with buyers for better prices as the buyers can save money by purchasing in one location, thus passing the savings on to the farmer. Participants also learn how to diversify their livelihoods in order to grow their businesses further. Hilário Valentim, a promoter from the village of Nlepa in Zambézia province, is keen to talk about how much he has benefited from the trainings. “I was very excited about the My Cashew Business training,” he said. “In addition to learning how to care for trees before, during and after harvest, I gathered all my cashews and negotiated the price with the buyer. Because of this, I sold my cashew for 37.5 MZN per kilogram while my colleagues sold for 35 MZN per kilogram." 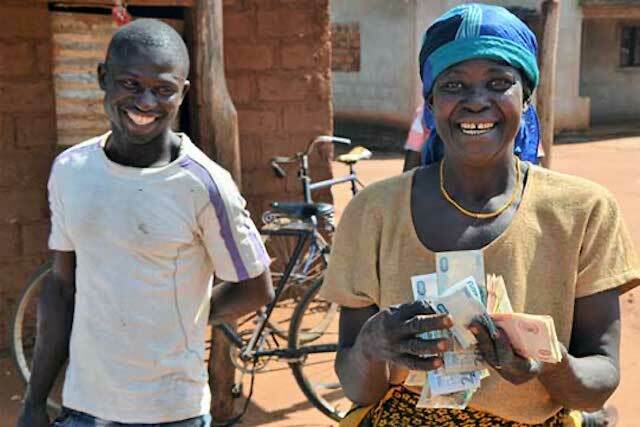 Though a seemingly small increase, by negotiating with the buyer for the first time, Hilário earned around $100 more for his harvest, a large sum in rural Mozambique. Hilário also learned how to manage and invest this additional income. Income management and investment are particularly important topics for cashew farmers for two main reasons. Cashew farmers receive payment for their product. Firstly, cashew brings in large amounts of money all at once, but needs to sustain a household for a whole year, as cashew is the primary source of income for many of these farmers. Knowing the best way to manage, spend and invest the money earned helps the farmers to sustain the impact of cashew farming. Secondly, though the production of cashew could still improve with increased investments in new planting, cashew farmers must also diversify their livelihoods as land is not an infinite resource. Investing in other crops and animals brings more income throughout the year and allows the farmers to be more resilient overall. "I learned that the profit could be used for other investments, so much so that I bought two cattle that I will soon breed,” said Hilário. “With cattle, I can have at least two liters of milk per day for my family, improving our health and especially for our children. I also bought two sheep.” Over the next five years, Hilário plans to become a big cattle breeder, and supplement his cashew income by selling milk and meat. Through the trainings that MozaCajú provides, Hilário, Alda and other farmers have been empowered by knowledge and information, which have not only enabled them to maximize their profits for cashew, but have helped them diversify livelihoods, strengthen their own resilience and expand their hopes for the future.